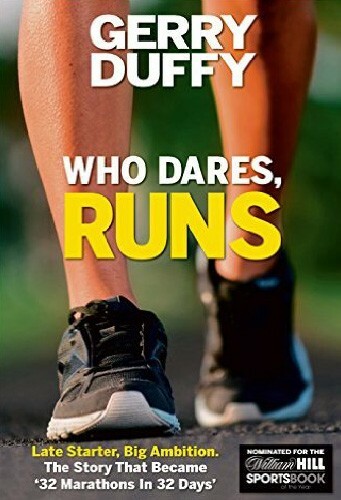 Nominated for a William Hill Book Award, Who Dares Runs (published 2011) tells Gerry’s truly unique story of how he went from a chain smoking overweight unfocussed twenty something (1995) to a person full of ambition and belief. It is a book bursting with true life stories and experiences. In it the author graphically narrates how he overcame a pathological fear of public speaking, started and grew a business (twice) and how he and Ken Whitelaw trained for and logistically pieced together the adventure of a lifetime- 32 Marathons in 32 Days. (2010). A professional speaker and writer on ‘motivation’ and ‘goal setting’, Gerry Duffy has a sporting CV which has seen him complete some of the hardest endurance challenges on the planet.